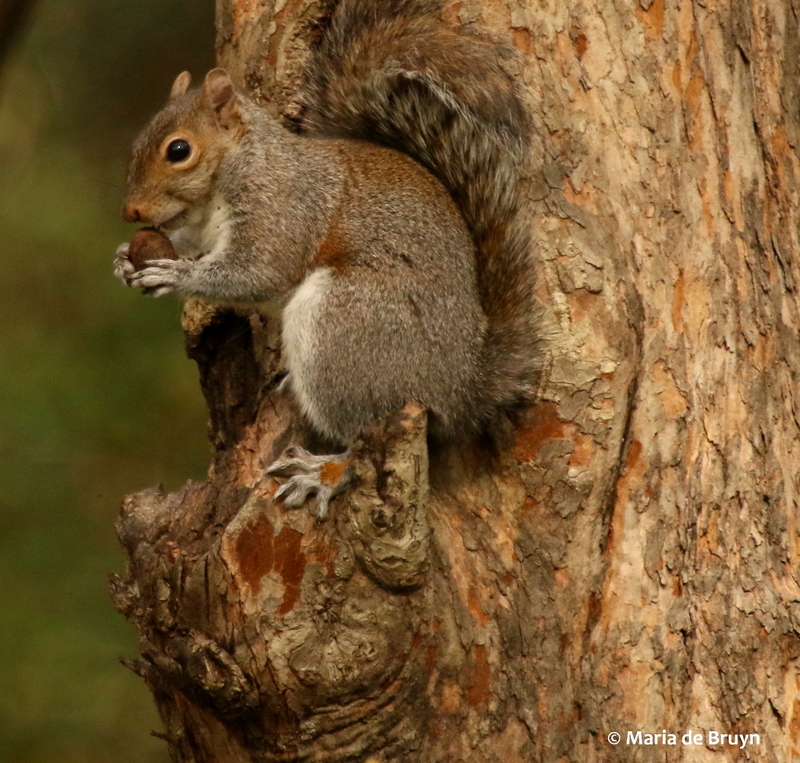 My squirrel nemesis – a worthy opponent! 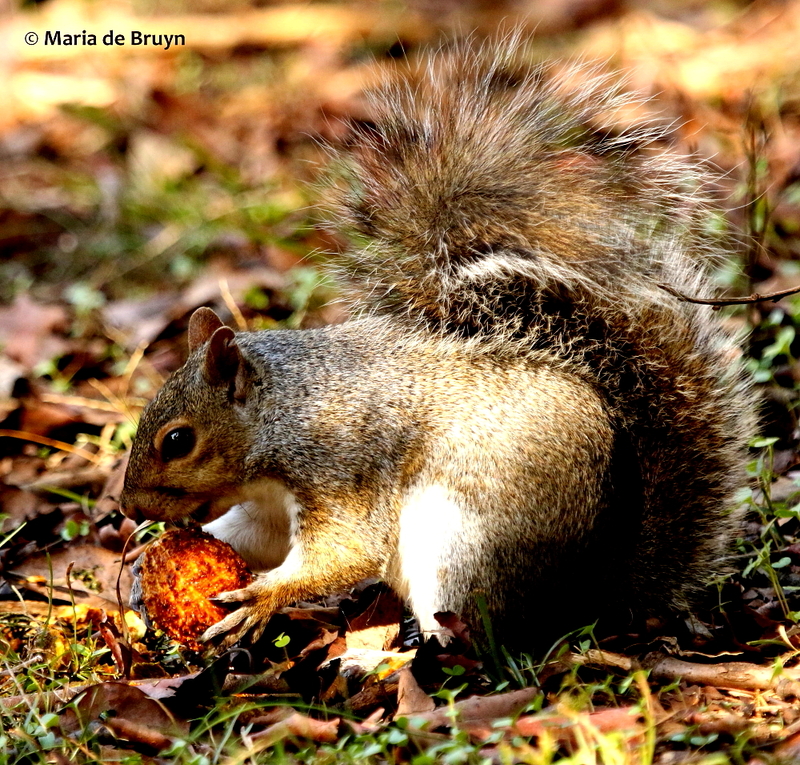 Today is Squirrel Appreciation Day in the USA, a holiday created by Christy Hargrove, a wildlife rehabilitator affiliated with the Western North Carolina Nature Center. 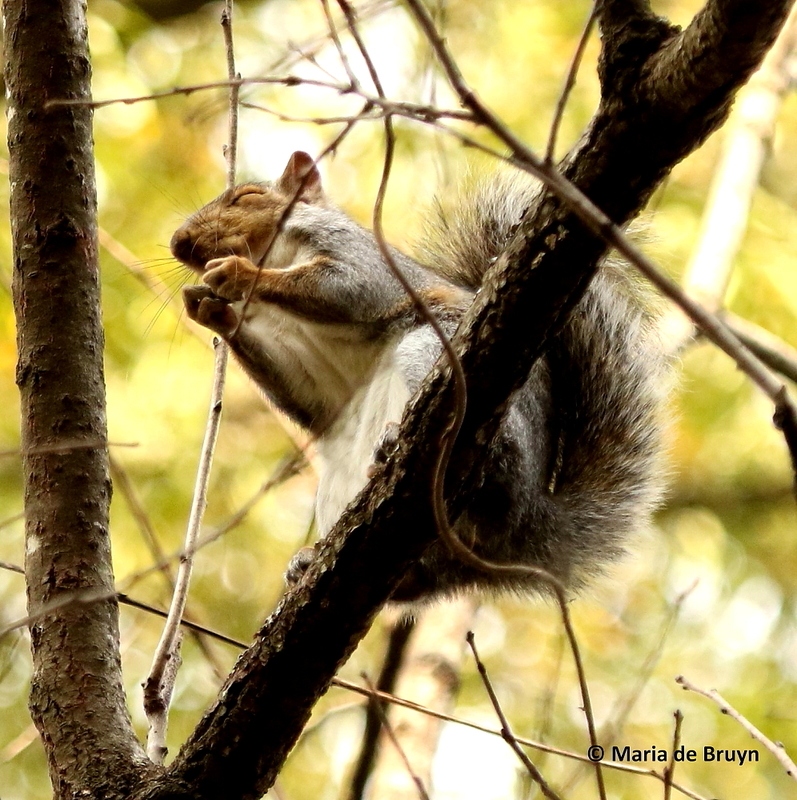 The Eastern gray squirrel species (Sciurus carolinensus) was first recorded in the Carolinas, so I thought I’d honor this wild creature by sharing some photos of the squirrels in my yard who sometimes drive me up the wall with frustration. There is one in particular who can get my ire up. 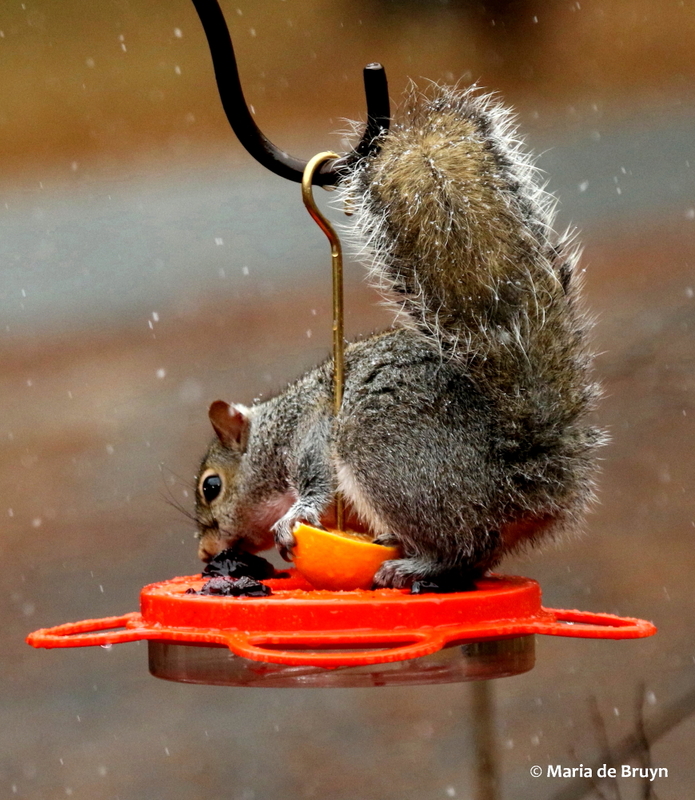 Of course, I realize it may not always be the same creature – perhaps several of “my” squirrels are taking turns in trying to overcome my measures to keep them off my bird feeders. But I do think one in particular is especially tenacious and persistent. 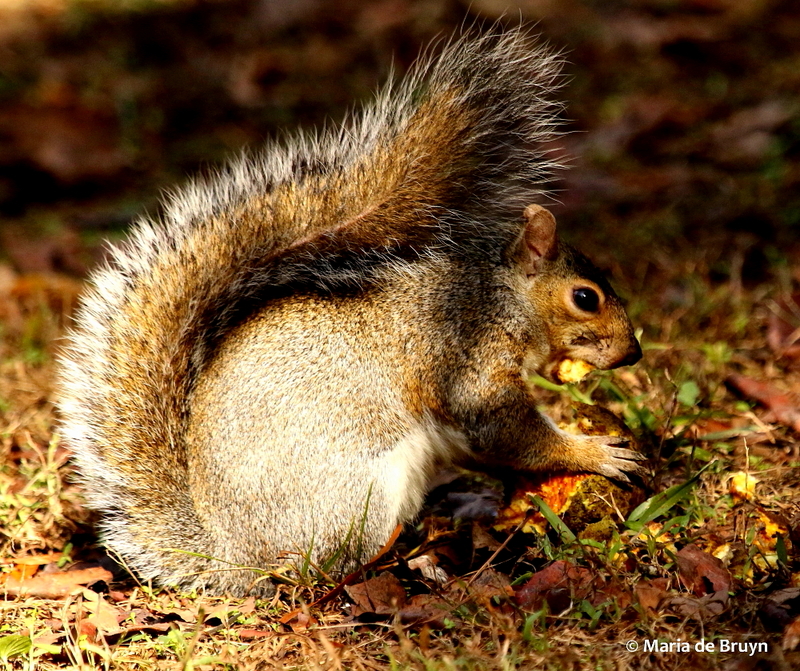 The yard squirrels are lucky since my neighbor has beech trees and I have a couple oak trees that provide plenty of acorns; these mammals therefore have plenty of nuts to store for winter. 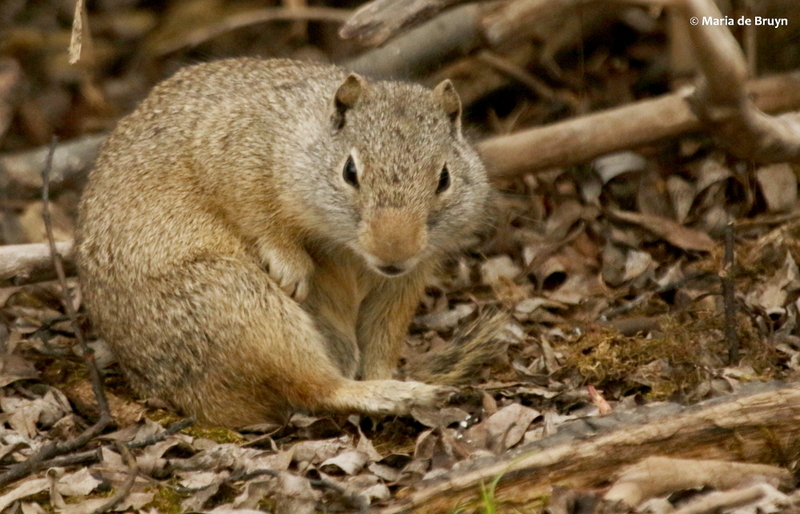 I periodically see them digging little holes in the lawn and different parts of the garden, “squirreling away” the nuts they have found in the trees. I also saw one burying some grapes that I had put out for the birds; that didn’t seem like a good strategy to me, but I have since learned that they will make temporary caches so perhaps that squirrel was just hoarding a treat for later. They have also occasionally gone after the persimmons. 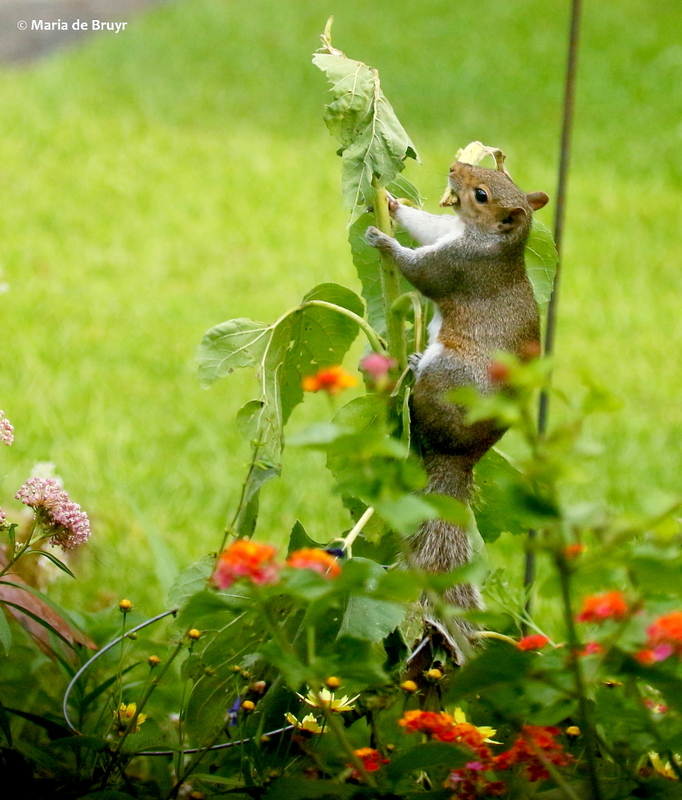 These squirrels aren’t satisfied with the natural bounty of the yard, however. 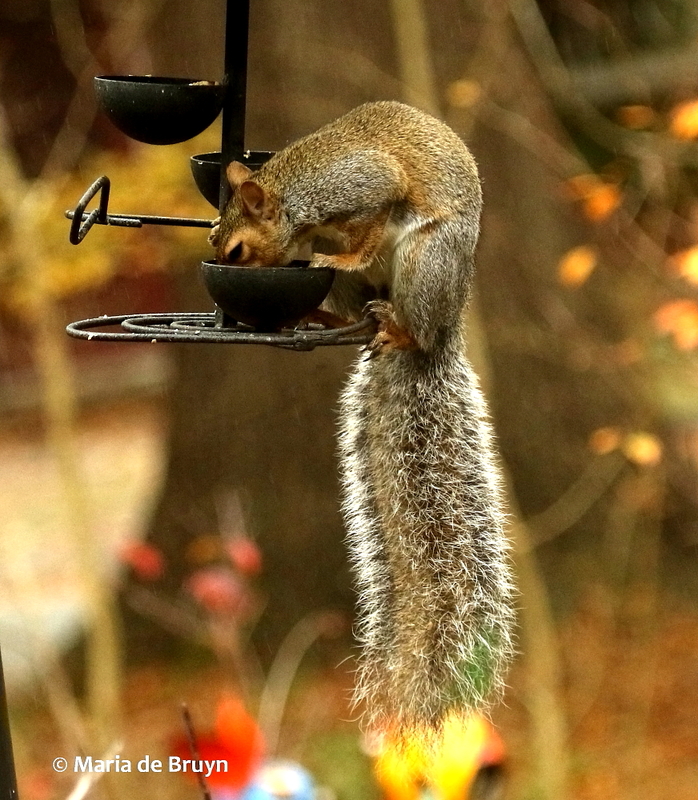 They also want to get the nuts and seeds in my bird feeders, even when they have been able to partake of the bounty strewn over the earth for the ground-feeding birds. I learned early on that the bird feeder poles need to be at least 10 feet away from the roof of my house and any sturdy shrubs or stumps that they can use as a launching pad to bypass the baffles placed on poles to outwit them. They do go up the raccoon baffle from time to time, testing whether they now might find a way through it but so far that has not been a useful strategy for them. One has managed to climb a thick-stalked sunflower so that it could nip off the seed bud. I had put a couple stumps in my front flower garden as natural decorations. 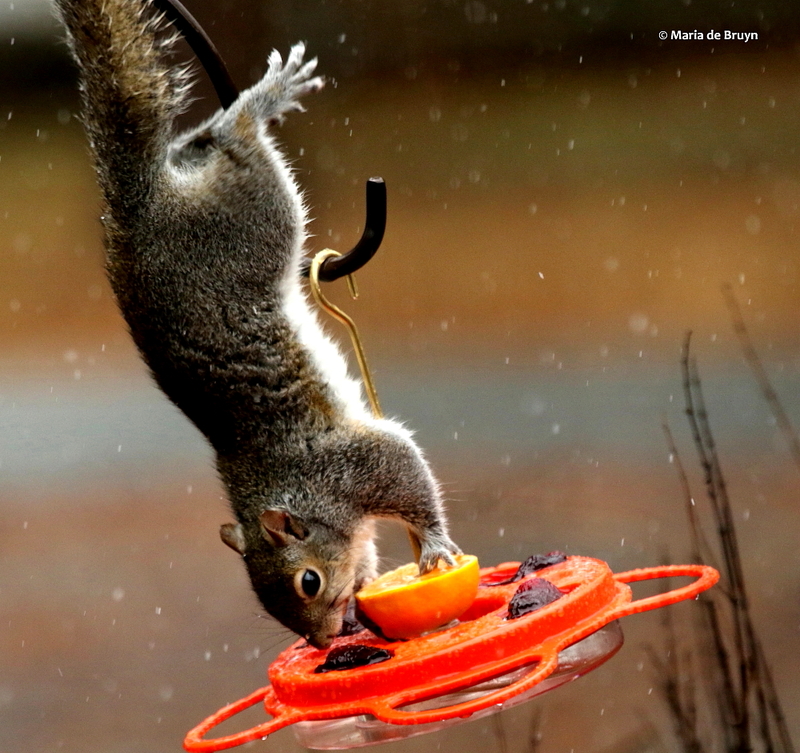 Then, it appeared that one of the squirrels was using a stump as a launching pad – managing to land above the baffles atop the nut and fruit feeders. I made the mistake of putting an oriole feeder on a pole without a baffle; I didn’t think it would attract the squirrels but apparently the jelly and nectar did appeal to one individual. Another time I had only a hummingbird nectar feeder on one pole, which seemed rather flimsy. But the squirrel had to check it out all the same, even though there was nothing to its liking there. As I have been removing invasive plants and shrubs from my yard, I’ve been adding native shrubs and plants. At one point, I thought it would be nice to have a black walnut (Juglans nigra) so I took a couple walnuts home from a park and then planted them in a deep plant pot with lots of soil over it. 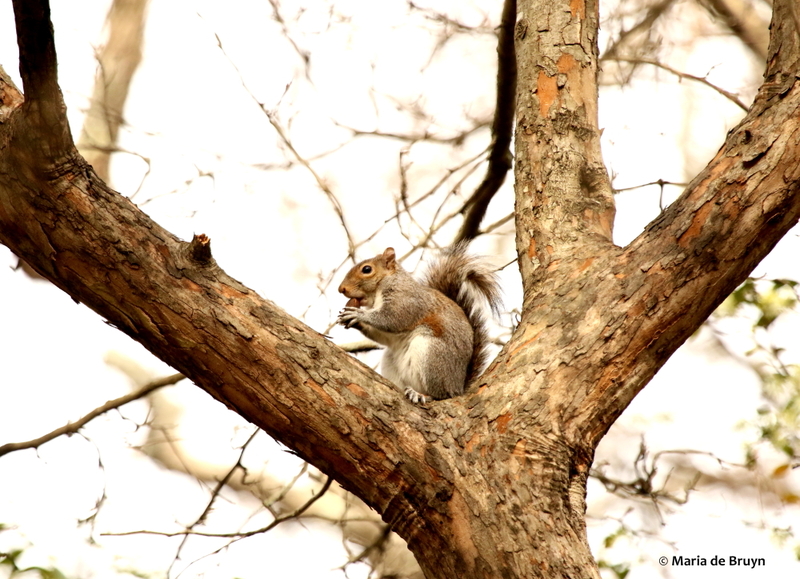 I had looked around beforehand and didn’t see a squirrel anywhere watching me, so I thought it was ok. 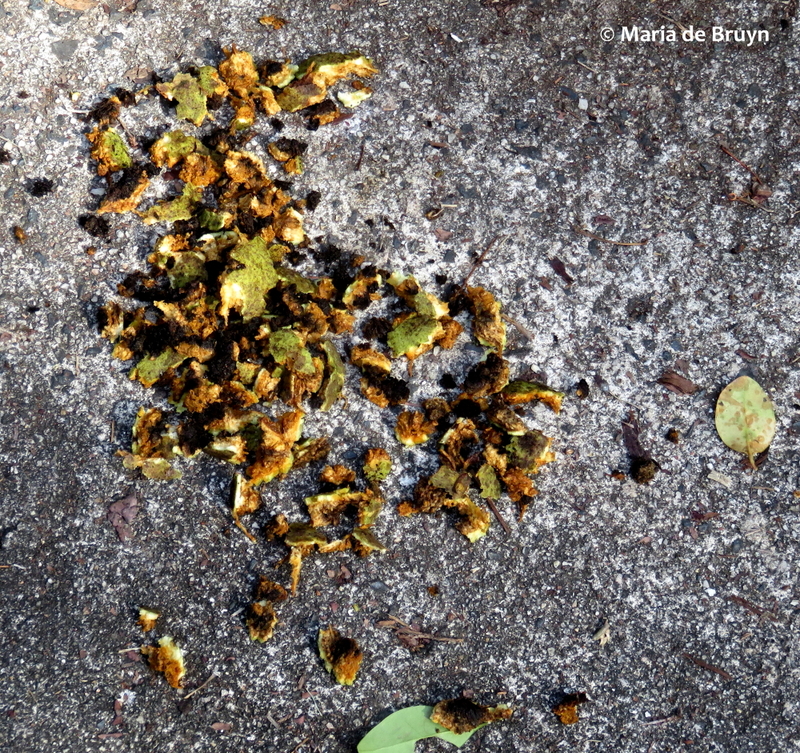 The next morning, I found a pile of walnut husks in the carport next to the plant pot. 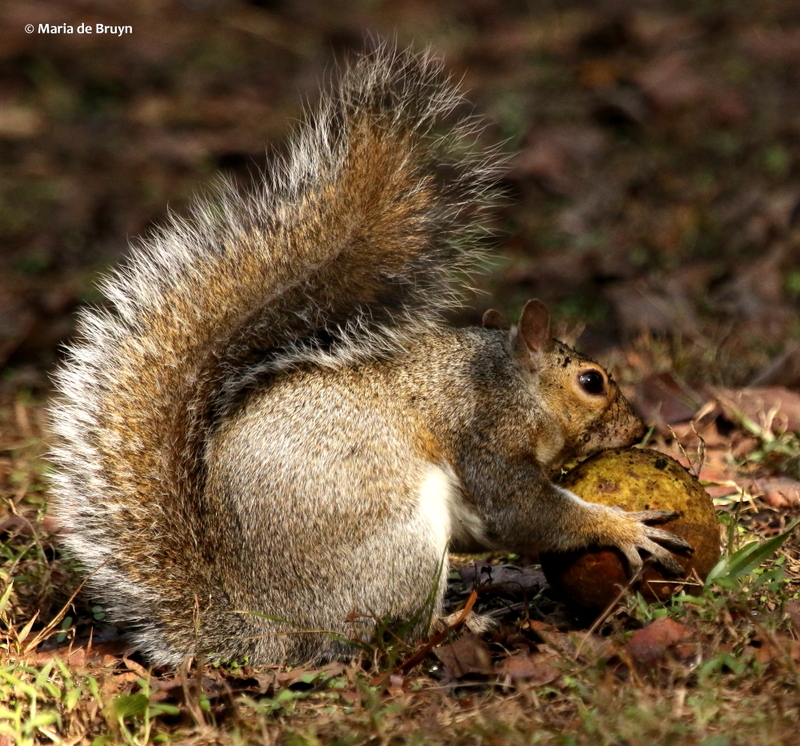 Then the next day, I saw one of the squirrels making off with the remaining walnut. 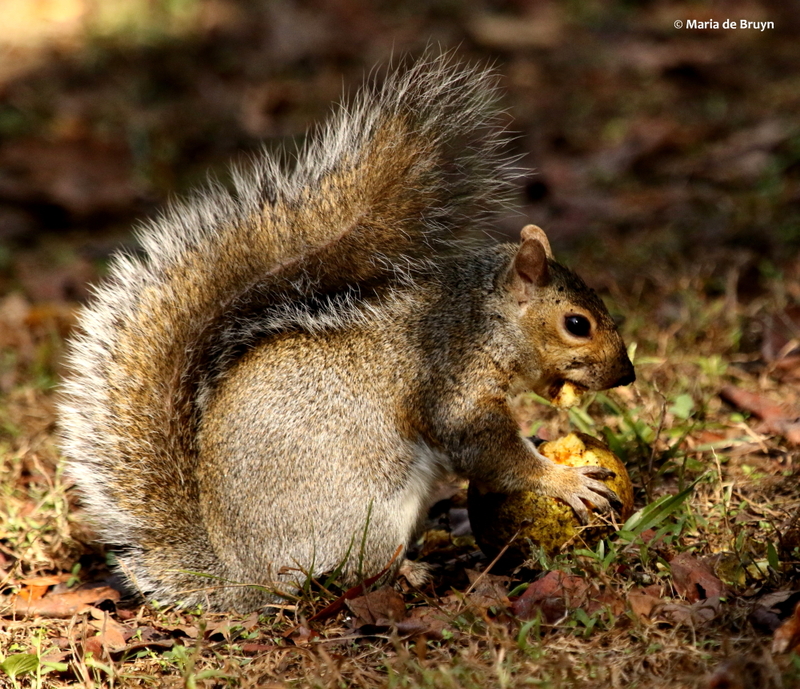 Apparently, they can re-locate their hoarding caches partly by memory and partly by smell – so this squirrel must have discovered the tasty walnut by its odor (which I couldn’t detect at all). The Eastern gray squirrels are only one of earth’s 200 squirrel species (there are four others in the USA: the fox squirrel, red squirrel, Northern and Southern flying squirrels and the ground squirrels, like this Uinta ground squirrel (Urocitellus armatus) seen in Yellowstone National Park. I’m glad that I mostly only deal with one species and while I must admit that I don’t appreciate them every day, I always do admire their tenacity, perseverance and ingenuity in finding ways to overcome my strategies for outwitting them. 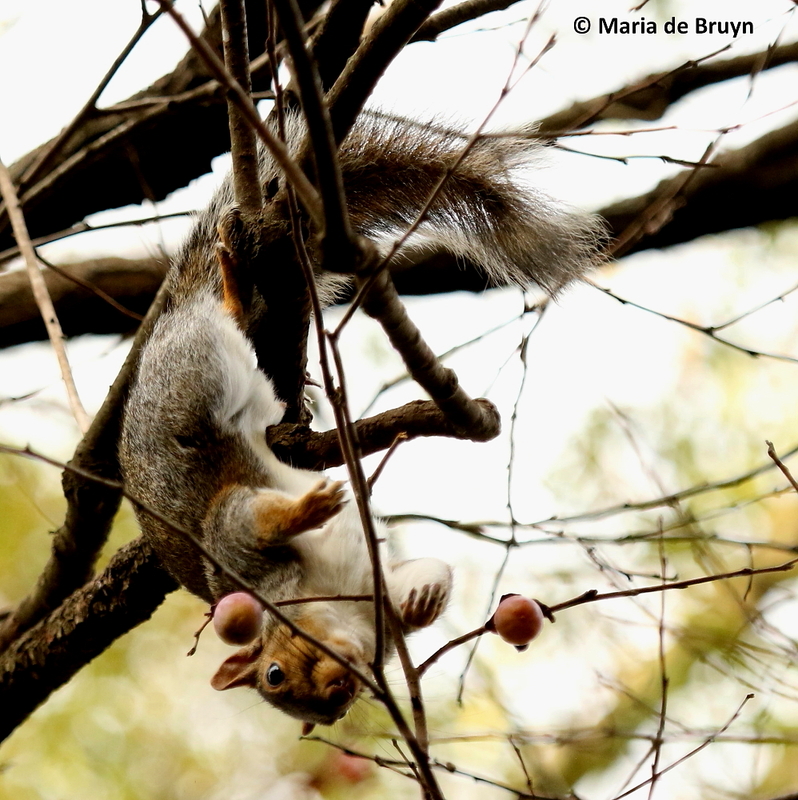 The squirrels are not only a source of food for the neighborhood hawks, but also a source of entertainment for the humans. This entry was posted in Animal behavior, mammals, Squirrels, wildlife and tagged behavior, bird feeder, black walnut tree, clever, Eastern gray squirrel, feeding, Juglans nigra, mammal, nature, nemesis, nuts, perseverance, scientific identification, scientific name, Sciurus carolinensis, Squirrel Appreciation Day, tenacious, Uinta ground squirrel, urban environment, Urocitellus armatus, wildlife by Maria dB. Bookmark the permalink. 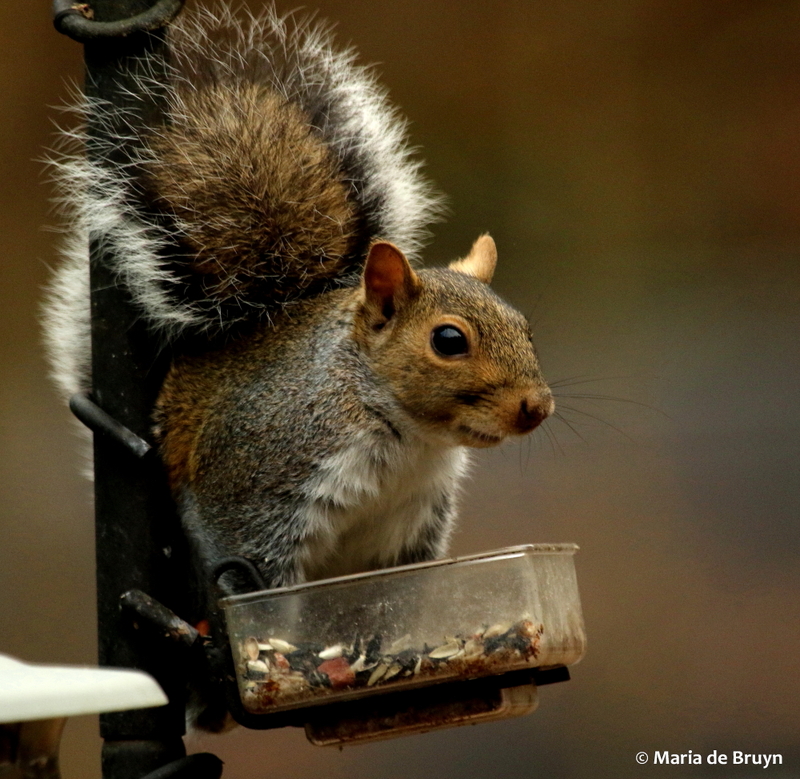 ….PS – Regarding squirrels – this year I am so enjoying my new transparent window feeders that can be attached with suction cups to the glass of a fixed window. 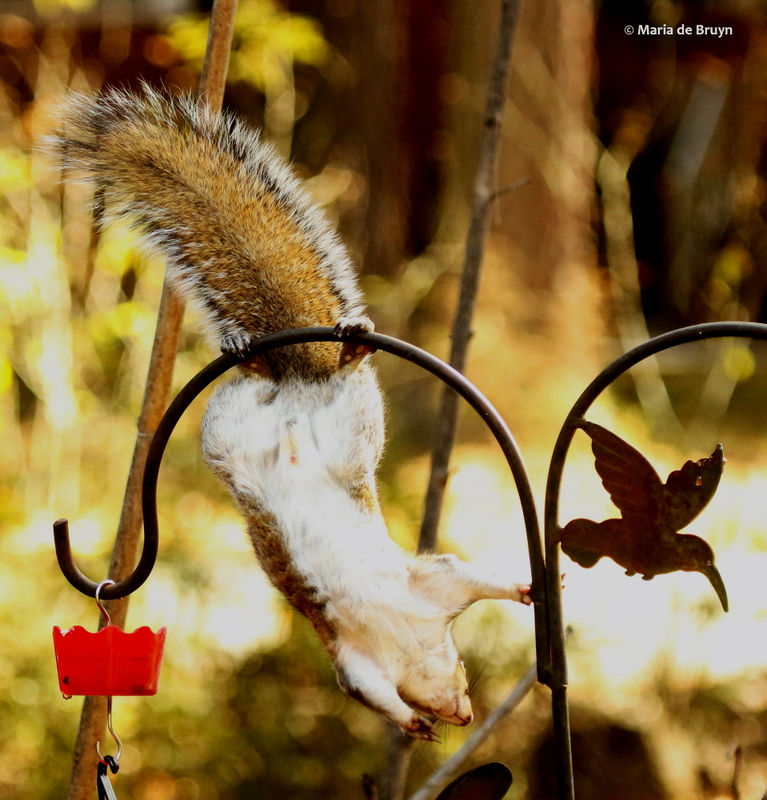 If hung correctly, they can be made truly squirrel proof and bring birds in for close observation. Because the feeders are small, they cater to the small birds. I serve homemade peanut butter suet and a mix of shelled and unshelled sunflower seeds, with an assortment of other nuts. My winter regulars at the window feeders are Western and Black Capped Chickadees, Pygmy Nuthatches, White & Red Breasted Nuthatches and Downy Woodpeckers. Even the larger Hairy Woodpecker can squeeze in:) House finches are aggressive feeder birds typically, and thankfully they don’t seem to like these new feeders. I have separate nyger feeders and hanging feeders that keep them happy, as well as the Blue and Stellers Jays. My greatest joy is watching, at eye level on my window, the Ruby Crowned Kinglet that is wintering in my yard. He flicks his wings as he gobbles up my suet. Isn’t nature grand?!! Your comment had gone to spam and I didn’t see it. So glad you like the blog, Gina. I tried the feeders that attach with suction cups and the squirrels in my yard managed to get onto them and knocked them down! But I can imagine what a pleasure it is to see the birds up close. When I smear suet on dried lantana and scarlet mallow stalks, one of my ruby-crowned kinglets will perch within about 5 or 6 inches waiting for me to finish – they are so very cute. Nature is grand indeed! Wow, Gina, that is certainly a strong feeder suction cup, to survive a bear pulling on it!